Without question, these are the perfect complement to the Samsung Galaxy S10 lineup. 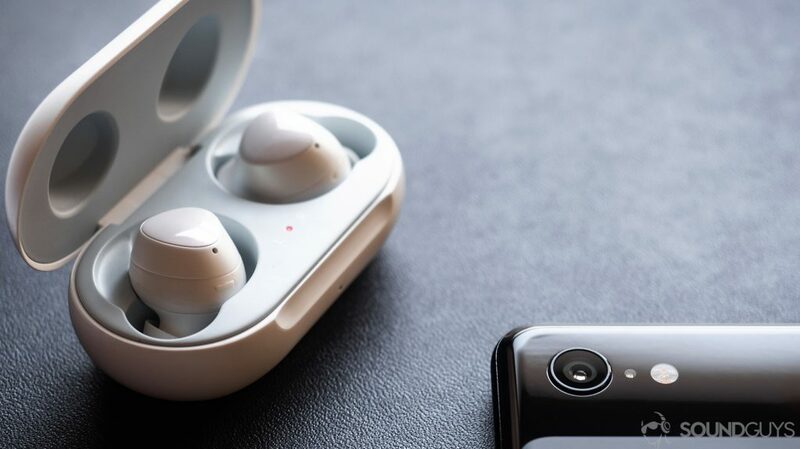 The earbuds' remarkable battery life separates it from the crowd of true wireless contenders, while its easy-to-operate touch controls make quick commands a breeze. What's more, the integrated dual-microphone arrangement facilitates excellent call quality, not to mention the Galaxy Buds' ability to reproduce a surprisingly accurate sound signature. With the release of the Samsung Galaxy S10 line, the Samsung Galaxy Buds are another excellent pair of true wireless earbuds to accompany the popular flagship. Whether you’re a casual listener or a true wireless fanboy, the Galaxy Buds are an excellent choice with a few forgivable foibles. Editor’s note: this review was updated on April 8, 2019, to address connectivity issues. Who are the Samsung Galaxy Buds for? The earbuds are compact and discreet. 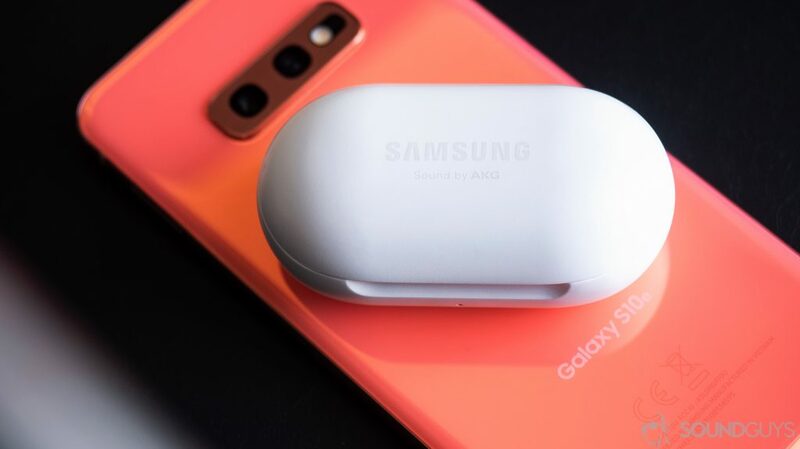 Seeing as the Galaxy Buds were a freebie for those who pre-ordered the Galaxy S10 and Galaxy S10+, they are explicitly for Samsung Galaxy S10 owners. However, that doesn’t preclude the earbuds from being used with other Android devices or iPhones. As a matter of fact, the Buds are compatible with the AAC Bluetooth codec, minimizing perceptible lag when used with iPhones. Related: What makes good workout earbuds? Listeners receive the IPX2 water-resistant earbuds, three pairs of silicone ear and wing tips, a 252mAh charging case, and a USB-C charging cable. The included wing tips allow for a secure fit while the malleable silicone remains comfortable for all-day listening. What’s more, the various ear tips are equally as comfortable but may not fit every listener’s ear. If you’re unable to get a good seal with the included options, try looking at third-party tips. What are the Galaxy Buds like? The Samsung Galaxy S10e, Galaxy S10, and Galaxy S10+ are able to wirelessly charge the Galaxy Buds. 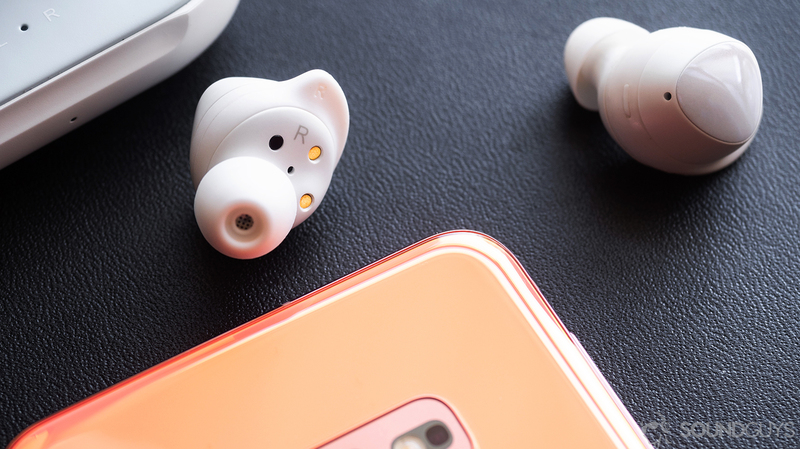 By sporting an all-plastic design, the Galaxy Buds are able to maintain a slim, lightweight profile, which is afforded by the removal of onboard storage. The edgeless shape of the earbuds creates a whimsical look and rounded triangular touch panels grant enough real estate to make commands without frequent mistakes. Samsung integrated a dual-microphone array, which operates by alternating between the microphones to attenuate background noise and clearly relay your voice. In practice, this worked well. Unfortunately, the earbuds still struggle outside if there are high winds but can combat background chatter if you’re in a coffee shop. The dual-microphone array adapts to your surroundings, effectively lessening background noise. The charging case is a plain, oblong plastic piece that opens hamburger style. Its interior has just enough room to house the necessary inlets for charging the earbuds. On the outside is a single LED indicator, which glows red, green, or yellow to notify listeners of its battery level. The back houses a USB-C input for charging. However, if you misplace the cable or don’t feel like using, you can place it atop your Samsung Galaxy S10 variant. Make sure the Wireless PowerShare option is turned on from the notification tray beforehand. The compact charging case provides an additional seven hours of playback. Touch panels facilitate call and playback controls, virtual assistant access, and Ambient Sound mode activation. Just like the Under Armour True Wireless Flash by JBL, the Galaxy Buds let you hear your surroundings, keeping you safe. By using the Galaxy Wearable app, you can customize the left and right ear panels. For instance, our review unit is set up so holding the left earbud initiates Ambient Sound mode and holding the right earbud accesses Google Assistant, not Bixby. From the app, you may set your preferred EQ option: bass boost, soft, dynamic, clear, or treble boost. Below that is a menu where you can choose which notifications are read aloud to you from the earbuds. Then there’s Ambient Sound mode. Rather than temporarily activating it from the earbuds, you can permanently activate it from the app. It lets you adjust how much amplification external noise receives and whether or not voices should be amplified. While you can choose your favorite EQ setting, you can also choose to disable it completely. You can designate the left and right earbuds to control different commands. You’re not limited to Bixby and can select Google Assistant. Then there are the usual features, like “Find my earbuds” and the option to check for and install software updates. It’s a comprehensive app that I actually found myself using. Granted, it was mainly to toggle Ambient Sound on for running. Speaking of running, these are a fine pair of earbuds for general athletes. While it’s disappointing that they received just an IPX2 certification, it should be enough to sustain arduous workouts. Just keep them out of the water. I really enjoyed using these in the gym; the provided wing tips worked wonders. I only wish that volume controls were also included like with the RHA TrueConnect. The carrying case charges via USB-C, and 15 minutes of charging the earbuds affords 1.7 hours of playback. One of the biggest improvements made to the Samsung Galaxy Buds from the Gear IconX is the improved battery life. Our objective testing yielded 6.53 hours of playback on a single charge from the 58mAh earbuds. The 252mAh charging case provides an additional seven hours of playback and 15 minutes in the case affords up to 1.7 hours of playback according to Samsung. Once the case and earbuds are both depleted, charging the devices is easy via the included USB-C cable. Compatible Samsung devices with Android 7.0 or later can use the Scalable Codec with the Galaxy Buds. Unlike many true wireless earbuds, these maintain a stable connection thanks to the Bluetooth 5.0 firmware, but they lack aptX support which is a bummer for non-Samsung Android users. On the flip side, AAC is supported to the main benefit of iPhone users. After using these for a few weeks (software version: R170XXU0ASC4), it’s apparent that connectivity still has a ways to go with the Galaxy Buds. While it remains reliable in closed environments, taking the earbuds outside welcomes a host of stutters and hiccups. There have been a handful of times when I’ve completely unpaired and repaired the Samsung Galaxy Buds with my galaxy S10e because the issue persisted spanning the length of a few songs. Samsung does, however, implement its proprietary Scalable Codec. This is compatible with limited Samsung devices operating on Android 7.0 or later. Much like aptX Adaptive, this codec is constantly optimizing bitrate to negotiate between stable connectivity and sound quality. The Samsung Galaxy Buds microphone effectively transmits the human voice thanks to its dual-microphone array. The dynamic drivers are tuned by AKG and reproduce a superb, neutral-leaning sound signature for a more accurate representation of your music than most consumer earbuds. Bass and midrange frequency loudness are comparable with a slight bump at the 1kHz mark to aid in vocal reproduction. Isolation performance is above par as these are able to passively insulate the listener from her surroundings if the right ear tips are used. Since the point of the integrated microphone arrangement is to record the human voice and clearly relay it, rather than record music, we decided to narrow down the microphone frequency response chart to the bounds of the human voice. This one performs well but can’t combat problem sounds. For instance, plosives and fricatives [f, s, th, sh, z, sh] will come through a little louder than other consonants and vowels. In all fairness, this is something that nearly all microphones struggle with even professional ones. Editor’s note: media playback for the following section was through the Samsung Galaxy S10e, which is compatible with Samsung’s Scalable Codec. The proprietary wing tips are comfortable and conform to the outer ear without causing pain. The Punch Brothers’ twangy ballad Jumbo, sounds excellent through the Samsung Galaxy Buds. I was nonplussed by the excellent instrumental separation between the mandolin, banjo, and cello. Once the shock wore off, I was able to fully revel in being pleasantly surprised by the earbuds’ ability to adroitly separate the various fundamental frequencies. The song begins with each band member playing his respective part: violin, guitar, bass, mandolin, and banjo. Five seconds in, the first guitar slide occurs simultaneously with a banjo strum. At this moment, both sounds remain audible without any egregious masking. During one of the choruses at 2:37, Chris Thile sings, “Here comes Jumbo, American as gumbo,” which is heavily underscored by aggressive bass picking and strumming of the guitar and banjo. It’s this moment that the song is most at risk of turning into an unclear din, but the Samsung Galaxy Buds handle this moment well, too. Granted, there is some frequency distortion that occurs, mainly to the bass: its harmonic resonance is nearly unidentifiable. Generally speaking though, these do a fantastic job at reproducing complex compositions but may not provide the exaggerated low-end that we’ve grown accustomed to from most all-purpose earbuds. The Samsung Galaxy Buds are the perfect companion to the Samsung Galaxy S10 phones. Yes. Battery life is head and shoulders above the competition without the earbuds being unbearable bulbous. If that’s not enough to convince you, the earbuds are remarkably comfortable to wear for hours at a time, and the lack of ear hooks means that those with glasses shouldn’t run into any issues with fit. While the lack of aptX support is a glaring oversight, it makes sense from a Samsung perspective as the company likely aims to push its proprietary Scalable Codec, which works wonders with a Galaxy S10 device. If you happened to be an early bird, who snagged a pair of free Samsung Galaxy Buds with your purchase, congrats on your excellent true wireless earbuds. Perhaps you’re someone who’s debating the earbuds with a non-Samsung device, though; if that’s the case, the earbuds are still a good deal with stellar battery life.